Schoola is a website that allows parents to donate gently used clothes to raise money for their schools. Right now on Schoola.com you can snag FREE shipping and $15 in credit. The Schoola discount code gives you enough money to buy a few individual items or an entire outfit. Hundreds of items are under $15, in fact you can several items shipped to you since some items are as low as $2.99! Just use code HURRY at checkout to score your FREE Shipping! To get the FREE $15 Credit you must be a NEW user. By following this link to Schoola, you'll activate a coupon code that gets you the $15 credit. http://www.schoola.com/?ref=sm-3X2dvj5R5. I was making a tech support call the other day and must have mis-dialed, because I ended up connecting to some "Free cruise" scam. The way these scams work, you get offered a free cruise only having to pay nominal "port fees". Once you pay those, you get forwarded to another agent who tries to have you pay for even more upgrades. If you actually try to go on the cruise, you will be told that you need to attend a number of time-share or other high-pressure sales presentations in order to get your boarding voucher. 150 YEAR AGO TODAY: April 14, 1865. Richmond had fallen. Lee had surrendered. The long and bloody Civil War was over. It was Good Friday. It was a time to rejoice. The Lincolns sat at Ford's Theater watching "Our American Cousin" starring Mary Lincoln's favorite actress, Laura Keene. Halfway through Act III, Scene 2, the character of Asa Trenchard, played that night by Harry Hawk, utters this line, considered one of the play's funniest, to Mrs. Mountchessington: "Don't know the manners of good society, eh? Well, I guess I know enough to turn you inside out, old gal — you sockdologizing old man-trap." During the ensuing laughter, John Wilkes Booth, a famous actor and Confederate sympathizer who was not a member of the cast, fatally shot Abraham Lincoln. Familiar with the play, Booth chose that moment in the hope that the sound of the audience's laughter would mask the sound of his gunshot. He then leapt from Lincoln's box to the stage and made his escape through the back of the theater to a horse he had left waiting in the alley. Lincoln would die the next morning, April 15, at 7:22am. This past weekend, I was part of an production where re-enacted the play and the assassination. It was a very moving event and there was nary a dry eye in the theater after each of the three performances. Audiences experienced the same joy everyone else felt on that day so long ago, and then, with a single gun shot, felt it ripped away from them. That's a testament to our playwrite/director and the entire acting company that worked so hard to bring it all to life. 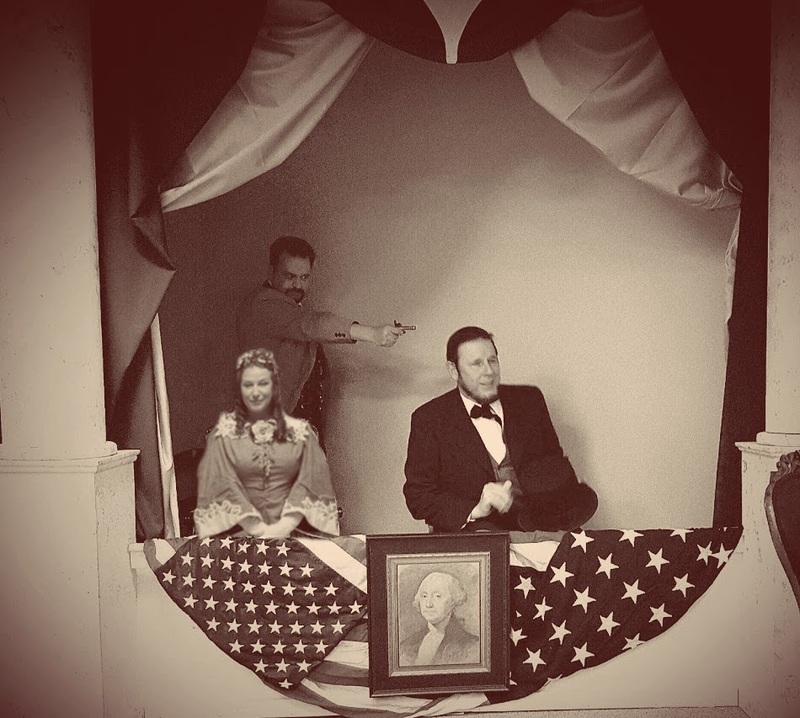 I played John Wilkes Booth in this re-enactment and it was a very intense thing to be seen as responsible for such a heinous act. In the re-creation below, you can see my friend portraying Lincoln as laughing at that final joke. I like to think that Lincoln's last feeling was one of levity.